With such low price tags on everything, it's easy to go a bit crazy at this two-story discount shop. Highlights include loads of affordable clothing, a towering bin of cute $2-per-pair underwear, and a bounty of bright hand towels (there are no towels in public restrooms, so everyone carries a reusable one). Oh the walk's not that long, peach. 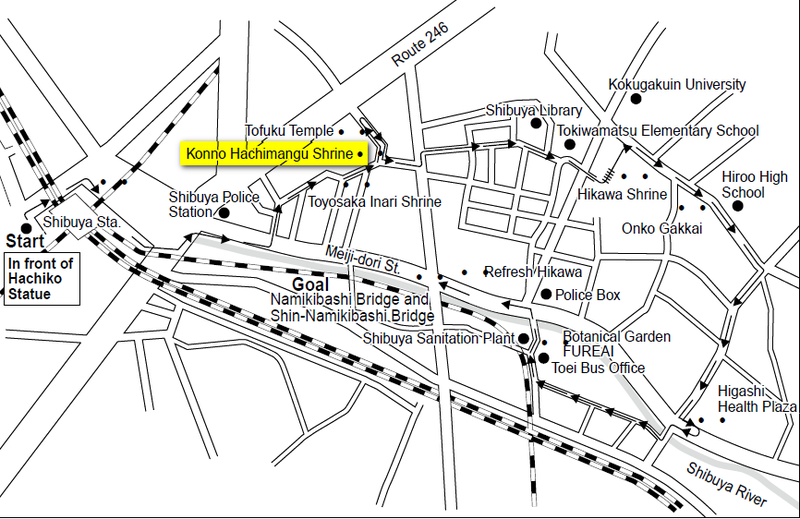 Only a quarter mile to "Three Minutes Happiness" from NHK studio. eta: Looks like it's an easy trek till they get to Shibuya Crossing. They may have to go through Shibuya Station to cross over the JR train tracks to get to the shrine. Hope they don't lose anyone in the station. Come to think of it, just Shibuya Crossing could be a nightmare herding a load of tourists through that maze. Here's a view of 3-Min Happiness. I thought that the Dennys you see when you turn the camera around might be same place Ray/Yolanda stopped for directions, but it turns out their Dennys was several blocks south. THAT is SOOO cool!! Can you do it at the shrine?? Thats really cool Slowhatch and by coincidence there is a movie coming out about the story behind the Hachiko Statue and ya'll know it was shown on Season 9 as well. I'm not sure if this is it. If it is, then it's perfect for production; in the middle of the city yet hidden from public view. Well puddin has me cryng about the doggie now, but I think that looks great! Somewhere today I bypassed a pic of the approach..I'll go looking again! I think the white building behind the site in your map may match this one? The map on the main Emporis page matches Boingo's spot. Flights from Tokyo Narita Airport if on Monday July 18 (see note below) or one day later to HoChiMinh City were most likely VN951 1030 1430. They are also 3 nonstop flights late in the afternoon, but I estimate they are much less likely. Note: I was doing the flight work for this from memory, assuming that they landed in Tokyo on Saturday July 16 , but I forgot about the International Date Line (who me?) and did not consult the calendar, which was off by 2 days from what was in my head. I had checked the nonstop flights NRT to SGN for Tuesdays and they are essentially the same. Flights from Tokyo Narita Airport if on Sunday July 17 or one day later to HoChiMinh City were most likely VN951 1030 1430. They are also multiple flights late in the afternoon, but I estimate they are much less likely. Teams don't arrive into Tokyo until Sun the 19th, I think we have been looking at Tues the 21st for a possible Pitstop release? Do those flights work then? Chateau said that Liisa and Eric's pics were taken very early AM, so that works if the clock is set to LA time..
That's what I thought. Please no. I count 6 teams in the photo and maybe one that we can't see facing Phil so that's 6/7 teams so maybe your question should be where are the other 4/5 teams. Thanks, Puddin. The plate on the ground and the one upper-right might be prefectural plates. I think it's more of, "With nine teams spoiled to make it to Cambodia, Eric/Lisa spoiled to be out in LA & Garrett/Jessica in the pic looking all happy, does that mean Marcy/Ron are last this leg? ", than "I wonder where Marcy/Ron are in this shot". That's REALLY cool! But why on the ground then?